The form of Mayan, according to tradition, is installed in Shiva temples and early Vishnu temples, seated in this way under a banyan tree, at temples throughout India. He is called Dakshinamurthi. Mayan is memorialized at these temples as Guru Murtha (the form of Supreme Master) and he faces South, from whence he came. Even today, Mayan is worshiped as “Supreme Guru” by enlightened persons. The knowledge of this has been lost to the public but has been maintained by the esteemed Vishwabrahmin Dr. V. Ganapati Sthapati who is actively building a Mayan Memorial in Mahabalipuram, Tamil Nadu, India. 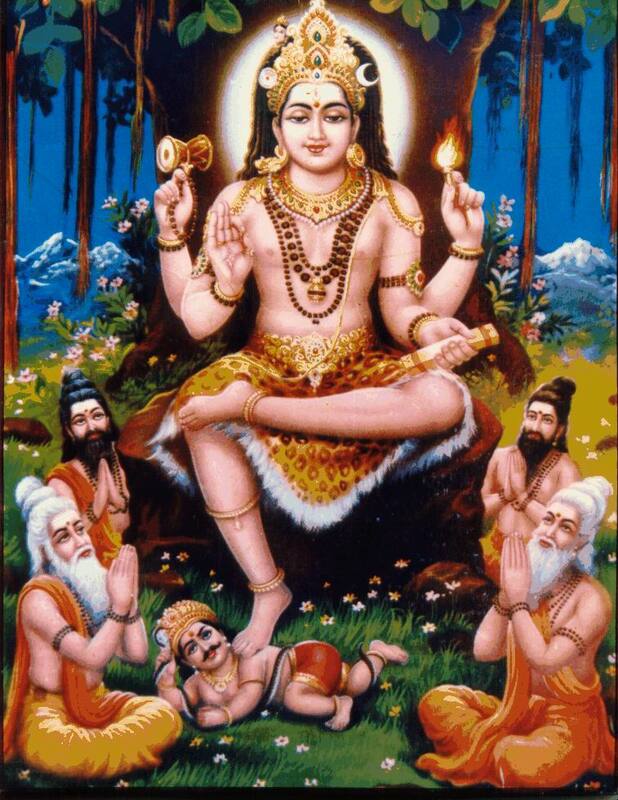 As per Religion / Saiva Philosophy, GOD Dakshinamurthy (literally means ‘One who is facing Dakshina or South) is an aspect of GOD Shiva as teacher or Guru of all types of knowledge. As Dakshinamurthy, Shiva is considered as the supreme iconic representation of the destroyer of ignorance and the embodiment of knowledge. In this aspect, Dakshinamurthy or GOD Shiva is regarded as the teacher of wisdom, arts, science, architecture, dance, music, and yoga. At one point in history, many cultures based their architecture, art, herbology, astronomy/astrology, etc. on Mayonic Science. In addition to the East Indian culture, cultures of China, Tibet, Mexico and Central and Southern Americas used Mayonic Science and Technology as the basis of their culture. We see evidence of this in the precise mathematical Vaastu formulas evident in the many Mayan structures existing today in Mexico and Central America, China, Bosnia, Egypt, Japan, and in other parts of the world. The Aztec ruins in Mexico and the Incan ruins in Machu Picchu, Peru also demonstrate Mayonic measure and order. Recent discoveries in Peru have identified what appears to be pre Incan Mayonic structures. King Solomon’s temple is clearly a Mayonic structure and its’ architect King Hiram was a Sthapati trained in this science. It is a known fact that a number of kings were of the traditional clans of Sthapatis’ (traditional builders). One well known Vaastu Shastra – the Samaranga Sutradhara – was written by a king (Boja Deva). One of those cultures even adopted the name Mayan – the Mayan culture of Mexico and Central America. The name Mayan is derived from Tamil – the language of South India and the language in which the original Vastu/Vaastu texts are written. Dr. V. Ganapati Sthapati visited Maya land and verified that the architectural principles of the Maayan temples were exactly the same as in Mayonic Science. In addition he found numerous Tamil words that were too similar to be coincidental. This is dealt with in advanced textbooks and studies in Mayonic Science and Technology. Chan Chan (Peru), Huete (Spain), Tulle (France), Hu-nan (China), Bethlehem (Israel), Tih (Egypt), Mississippi (United States), Humac (Brazil), Nagasaki (Japan), Mul (England), Maya (Russia, Naga (India), and hukotz (Bering Strait) are all words associated with both the Maayan culture and Tamil culture. There are numerous Hebrew words that are similar or the same as Tamil words. Scholars have indicated that these language similarities originated from Tamil land. That is, Hebrew has its basis in Tamil. One such word is Ma’ayan. In Hebrew the word “ma’ayan” means spring, fountain, wellspring as in wellspring of knowledge. A women’s poetry group with this name exists even today. Interestingly enough, Mayan was a great poet. The names of all these places are of Tamil/Maya origin, which indicates that, in different periods of time, there was a Mayonic presence in these places. Ancient Tamil literature confirms that Mayan and or his twelve main disciples traveled the world. It would make sense that when he sent them out to teach this knowledge, they would go to places around the world where there were people who spoke their language – the clans who left Kumari Continent and spread throughout the world. It is possible that is what brought Mayan and his Rishi students to other parts of the world to teach. 1. Fabric of The Universe: The Origins, Implications, and Applications of Vastu Science By Jessie J. Mercay. Text and diagrams, with permission, from Dr. Jessie Mercay, Fabric of the Universe, aumscience.com/wordpress. For any questions please visit http://www.aumscience.com. This entry was posted in Mamuni Mayan - Father of Science, Science, Spirituality, Temple and tagged art, articles, culture, GOD, history, inspiration, philosophy, religion, science, spirituality by Ganesh. Bookmark the permalink. Ganesh, this is an excellent post. There is some evidence that Kumari continent is not as depicted in the drawing you have shown. It may have indeed spread to Madagascar but if you analyze the ocean depths, it appears that there were sections of the continent to the South East of the southern tip of India but there appears to be a large area of open sea directly South. Then landmass picks up again and covers all of what is now Cambodia, Thailand, Indonesia, Austrailia and that entire region. I map this in Fabric of the Universe. The oceans are too deep directly south of the Indian sub – continent to have been ex[osed land 10,000 BC during Mayan’s time. Anyone interested can simply go to google Earth and look at the ocean depth less than 450 feet and you will find Kumari Continent. I did extensive research on ocean depths, rise of the ocean since 15,000 – 10,000 BC and weather changes during that time. While portions of the continent may have submerged due to quakes and plate shifts, it is most likely that the low land masses were simply engulfed by the rising seas. If the seas rose another 400 feet then massive amounts of land would simply be engulfed. Another interesting point is that Brahmarishi Mayan traveld from S. India all the way to the Himalayas and further. His students referred to him as Mayo, Maya, and Vishwakarma. He was referred to as Vishwakarma in the ancient texts because he had the skill to replicate the mathematical order of the Cosmic Creative Source also known as Vishwakarma. The science that mayan revealed is deeply profound yet under appreciated and under acknowledged. It is great to see you making that acknolwledgement here for all to see. Thanks Respected dear Dr. Jessie Mercay! This blog is blessed with your great insight and research. Completely agree with you. Appreciate your great works and looking forward to learn more. Dr.jessie mercay iam very glad to see a post from you. iam a tamilian and iam very much interested in mayans theory of vibrations of self. i would like to go through his literatures but i couldnt find themon internet. can you provide me any references. iam very eager to read mayans literatures. have you seen those tamil versions. how do they look lke(olai suvadi). are they still preserved. when are you going to publish pranava veda of tamil version. Jacob raja, If you go to http://www.aumscience.com and then to the bookstore you will find a link to get my book Fabric of the Universe. This book is entirely based on the science and practice of Mamuni Mayan. I also teach in India in January a course based on his work. In addition, you can contact Vaastu Vedic Trust headed by Sthapati Dakshinamoorthy (you can find him on facebook). VVT is the child of Dr. V. Ganapati Sthapati now deceased. Dr. VGS published the Aintiram in Tamil and the first 1000 vs of Pranava Veda – both by Mayan in Tamil. I have been working with Mayan’s ideas for 10 years and find them to be the most profound in the world. I have come to believe – through extensive research – that Mayan’s work is the basis for the Vedas. This is a bold statement but the evidence has piled up to the point that it seems indisputable. Dakshinamurthy seems to show attributes I identify with archetypes Lugh (Celtic), Mercury (Roman) or Prometheus (Greek)… it is a powerful archetype found in all cultures. This wil reveal the universality of proto tamil sciences and unite the whole of mankind under one origin of wisdom.